I notice the funniest things since I started renovating a house. 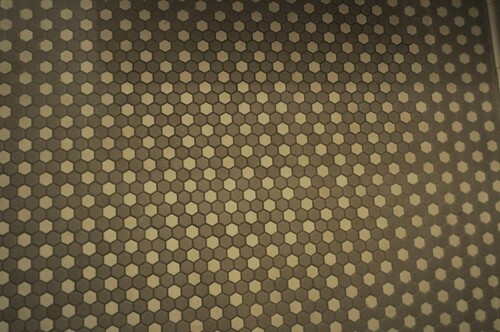 In our bathroom at the Soho Grand Hotel I was fascinated by the subway tile design. If you look closely the second tile from the top is not a standard rectangle. It’s square, interesting. I couldn’t find a reason why they did this other then to break up the line. The hotel bathroom was simple but classic. A pretty pedestal sink with a gooseneck faucet and a stone hex floor. The floor tiles were cream, taupey brown/gray, and gray grout. Kinda funky and different. Look closely at the floor photo below. It may look out of focus on the edges but actually the floor really looked like this. It would change color as you looked at it in the distance. The sketch wallpaper keeps the space from feeling too traditional and adds a modern twist. Below the view from our hotel room. How great is New York? update: The wallpaper featured in the bathroom is by New Yorker cartoonist Saul Steinberg. The paper can be purchased through Schumacher. I am leaving for NYC on Wednesday and your posts arrived just in time. I am going over all your hints before I leave. very acute eye! love the subtle, interesting details. The Soho Grand was having a winter special. Greg and I haven’t taken a real vacation since buying the house so I am trying to book a few short weekend vacations away every few months. Honey. Really. You travel in style. You report in style too. Thank you. Don’t you just love going to that town? Nice to see that the hotel stayed true to a bathroom decor style prevalent in the NYC area. Looks like a nice place to stay! It appears that maybe the single square row of tile is needed to hang the towel rack and glass shelf. Hmm I wonder who makes it then? Jen had a sample from a photo shoot and thought it was Nama Rococo. We’ll have to keep searching. I love Nama Rococo wallpaper.. I did not see this pattern on the site.. the owner/designer, Karen Combs, likes it too, but does not know the designer or manufacturer.. I love the unique line of tile in this bath too. That gray and white octagon tile on the floor is damn near perfect–love! they like playing with their guests heads at the soho grand – the wall tile gives the illusion of depth and the floor is really interesting. lucky girl – looks like a fabulous place to stay. Wow, this is really fabulous. And Katy, you are traveling in style. I love when hotels have cute bathrooms! That Nama Rococo wallpaper looks fantastic. So fun and whimsical. Hope you had a great time in NYC, Katy!